The Daily Is Interesting, But Is It the Future of Newspapers? There’s been a lot of pre-launch interest in Rupert Murdoch’s new iPad “newspaper” The Daily. This is partly because the News Corp. (s nws) founder is known for making ambitious bets on new technology — even if they don’t always work out, as he found with MySpace — and also because Apple (s aapl) was a key partner, and used the News app to launch its new subscription model for content (it costs 99 cents a week or $39 for a year). So does The Daily live up to its billing? Is it the future of newspapers? Not really. It does some interesting things, but it also does some very confusing things, particularly around sharing content. And much of it, apart from some bells and whistles, consists of fairly humdrum day-old stories that you might read in, well…a regular old printed newspaper. The first clue to what you get with The Daily, as more than one person has noted, is in the name itself. It is published more or less just like a regular newspaper, in the sense that the bulk of the content is produced and then published to the app once a day. Although News Corp. made a point of noting at its launch event that the app will be updated throughout the day as news breaks, there was no sign of that happening while I used it for most of the day on Wednesday, and that was while riots were still breaking out in Cairo. Even though Twitter content appeared in a box in one of the stories (a profile of Rihanna) and had live links, the actual tweets themselves were almost 12 hours old — even after the app updated itself and said it was downloading a new version of the paper. It’s like a newspaper…but on the iPad! The result is that you get something that feels very much like a newspaper, with stories about things that happened yesterday. And while you can share stories via Facebook and Twitter, none of the pieces contain any links to anything on the web, making the app feel very much like similar apps from print publications like the New York Times, Esquire and Wired — disconnected from the Internet in a lot of ways. There are live links in Twitter streams in stories (particularly the customizable sports section, which lets you follow teams), and there is a small section of links called “What We’re Reading,” but other than that there isn’t a whole lot of linking going on at all. There’s also no way to contact the writers or interact with them in any way, as Salon founder Scott Rosenberg noted, apart from posting a comment (which you can also do via audio, an unusual choice). All of that aside, the biggest issue with The Daily is that even when you share a story, there is little that might encourage anyone to cough up the money to subscribe (a Columbia Journalism Review editor called it “a general-interest publication that is not generally interesting” and added that “great design will not trump lackluster content”). In the inaugural version, there were a couple of features that were worth reading, but they didn’t add much to similar stories that have appeared elsewhere for free. And a surprising amount of what appeared in the app — once you got past all the videos, most of which were devoted to advertising, and the interactive Sudoku and crossword puzzles — was run-of-the-mill news briefs that you might see in any newspaper such as USA Today. If the content is ho-hum, what are users paying for? Much of the pre-launch promotion of The Daily suggested that it was going to focus on the content in a way that many newspapers don’t, and that the $30 million or so Rupert Murdoch was spending on the project indicated there would be a higher level of quality. But while the app is well designed and the articles and photos are nice to look at, there isn’t a whole lot on the content side that makes it any better than newspapers that can already be read for free — and whose links can be shared and read without the bizarre restrictions that The Daily has invented to try and convince people to pay for it. David Weidner of WSJ’s MarketWatch said that “the pricing is right,” and that $40 a year made more sense than $240 a year for the New York Times, and it’s true that the low price may get some to sign up — but the bigger question is, how many? 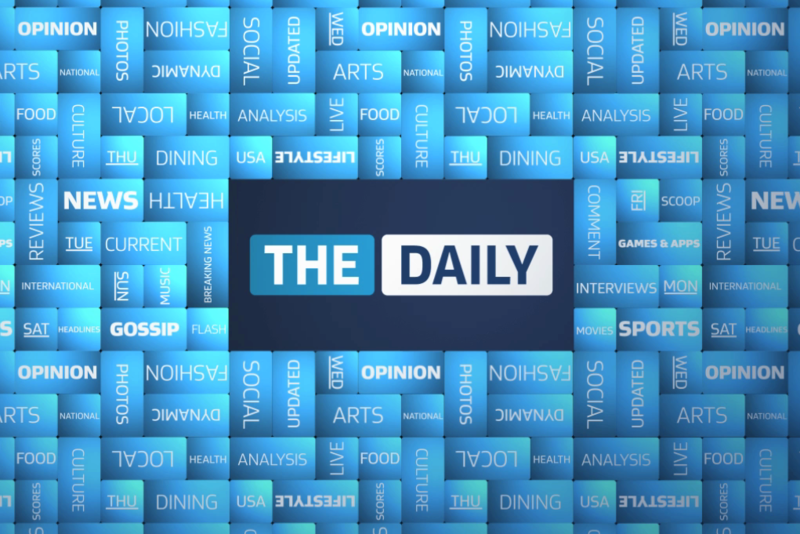 I have some additional thoughts on why I think The Daily will fail. The main reasons, other than the ho-hum content you mentioned, are that it’s an app centric model, it has a complete lack of diversity, has too little content (as you pointed out), there’s no control over content, it has an inefficient user interface, and the subscription cost doesn’t justify its existence. 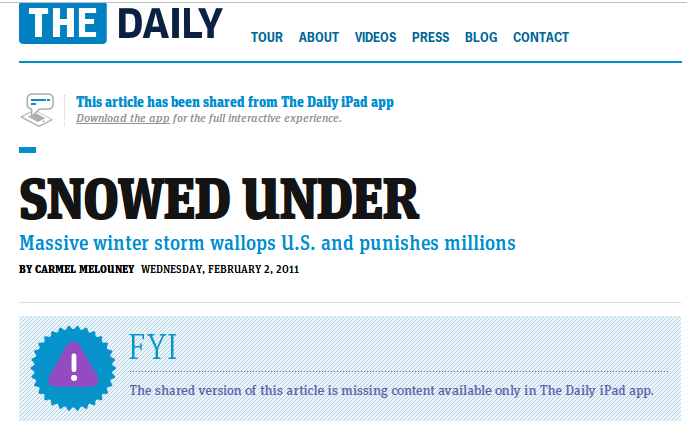 Hmmm – it seems that the main beef with The Daily is that it is basically like Time or USA Today, only digital. And the conclusion is then, “who would pay?” To me, that doesn’t follow – millions of people pay for Time and USA Today. And the ability to have a purely digital version on my iPad is a plus over those other periodicals. So even if only a small percentage of the people who *already* pay for day/week-old news switch to The Daily, it will be a wild financial success, which is more than can be said for traditional journalism today. That’s a fair point, Matthew — perhaps we are expecting too much of The Daily. If it can attract readers who already pay for print it might succeed — but then what do those newspapers do for revenue? I agree with the general comments and points made thus far but I do want to point out the evolution of new media is not always a smooth transition. The Daily may not be “the publication of the future” since there are obvious areas they need to improve upon but I would suggest that instead it represents how we will most likely consume content in the future. I think it adds an option that we should embrace and not see it for what it is right now but what it could become. You and I have had the conversation before, Matthew, that news consumers continue to be willing to pay goodly sums for outstanding content, your alumnus Globe and Mail being my primary example of this. Touch, swipe, tap? A bit generic to the device. I would have to agree – it’s beautifully designed but doesn’t go very far in the reinvention of anything. It doesn’t look at the dynamics behind how news has changed and applied that to the ipad and the social aspects of the Web. So how would you change it? Everybody talks about it being “old”, but nobody suggests alternatives. What’s better than swiping? The Daily is a news aggregator. As such, they’ve chosen to publish daily. I don’t find that a bad thing. After reading a couple of days worth, I’ve seen a bunch of stuff that I didn’t find myself on the web. Could I have found it if I wanted to look hard enough? Sure. But if somebody is going to do the work for me… at 14 cents a day, maybe it’s worth it. I tried out The Daily this evening and generally liked it. Very USA Today. The initial “story” is the technology, but in the end it will be about the content. I think the technology is “good enough” for a version 1 and I am sure will improve over the course of the next year. I think if they can get compelling, exclusive content from voices that people want to read, then it will be a hit. if they don’t it will be a bit of a novelty. My fear is that because it is on the iPad and they want to curry favor with Apple, the content will be bland, generic and lack a point of view. All the liberals concerned about Murdoch porting Fox News over to the iPad do not have much to worry about from what I have seen so far. However, I think they should recruit top News Corp stars to write exclusive content. That is what I would do to drive traffic to the publication. As for the lack of web site content, I sent myself links to the content and viewed one of the articles on the web. It had the same structure as any other news sites. All they would have to do to make that content available is to create the links and menu on the front page. My guess is that they will eventually make the content accessible via the web to subscribers, but I think they probably want to “train” people to go to the iPad and embrace that paradigm first. Only time will tell if this will be a success, but you have to give Murdoch credit for taking the plunge. Have they made the links traceable? Unique link, one point “picture”, hidden .. in code after you open it. So they can trace who is sharing with whom and which one finds its way to search. The Daily may be the final nail in the newspapers coffin but its not, as is, the publication of the future. It may be successful, at least initially, due to the enormous hype surrounding it and the sheer brand and promotional effort, but I donâ€™t believe it to be an example to follow, at least from the editorial model perspective. I like the platform (assuming bugs are squashed soon) and hope to see other publishers adopting or copying it. Kudos for the effort. However, being iPad only is a big down side. This means I canâ€™t continue reading articles on my iPhone when on the go. The future of publishing should be on multiple platforms. This is just replacing the print edition with a single digital edition. It makes sense that the highly graphical pages are not available elsewhere but the long texts, and they are long, canâ€™t even be sent to services such as Instapaper (although you can achieve this by emailing the link). The pricing is right, assuming the content is compelling and exclusive. What I find unfortunate is the use of the same old-school â€œnewspaperâ€ paradigm and content style. Why insist on creating a â€œvarietyâ€ publication when itâ€™s so hard to compete with verticals? Why insist on boring, long-form analysis coupled with light celebrity stories? The bells & whistles are cool but donâ€™t really make the overall publication more interesting than a typical print newspaper. Unless you grew up reading them. The first editions doesnâ€™t provide much that Iâ€™d be willing to pay for. The only â€œexclusiveâ€ may be the analysis on Egypt but even then it isnâ€™t hard to find pieces that give me more, for free. App reviews? Please, there are hundreds of better sources! Fashion? Celebrity coverage? Come one! Even Peopleâ€™s digital edition of their magazine provides better images and content. Sports? I donâ€™t care much about the sports being covered. Why canâ€™t I skip those sections? Even if I cared, Iâ€™m sure there are also better sources. Itâ€™s a good effort but editorial innovation is nowhere to be found (Iâ€™ve seen print newspapers with more innovative content). Oh, thatâ€™s right, this comes from Murdoch. Itâ€™s too much to ask. Even the platform is not so unique. Popular Science, Popular Mechanics, Wired and other magazines are not so different. Iâ€™m looking forward to the next generation publishers using a platform such as this one. Iâ€™m looking forward to niche publications using this platform. That will certainly be the next generation of publishing. I don’t always agree with you but I think you’ve nailed this one. TheDaily feels like a huge step back. Trying to put a genie back in the bottle type of thing. 1. There is nothing compelling from a technology standpoint. There are already better apps in the store. 3. The blockades in place will just prevent dissemination of the content. 5. This is the company of Fox News afterall.. I really like the article OM published this morning regarding “What Makes a Hit (Consumer) Internet Service”. If you apply that framework to this, I think that the big missing ingredient is “simple to use”: Although there is an initial wow effect, it quickly wears out. The app feels slow and cluttered. I was actually really impressed by the show put on today and feel that this could have a really deep long term impact. They need to simplify the UI. Make it a little more real time and focus more on quality/unique content instead of “rich multimedia effects”. I agree, Edwin — it is kind of clunky. Thanks for the comment.